SC Controller [github] is really awesome! It's a standalone UI and driver for the Steam Controller. It was pointed out to me that it has a new gestures feature and I was asked to do a video. Here's a quick look at this fun new feature. Essentially, it's swiping your finger on the left or right pad in a shape you define yourself to perform various actions. So I set swiping up on the left pad, to emulate pressing number 1 on the keyboard. What you're seeing in the video when it shows the shape being drawn, is me actually drawing that shape on the left pad of the Steam Controller. I am not manually typing in the arrows, it's picking that up by me drawing directly on the pad. I imagine this would be useful for a number of things, it certainly expands your available options for what combinations you can have stored. From what I can tell, this is an original feature for SC Controller too, as it's not present in Steam itself. What's great is that it can happily work alongside Steam, as you can turn off SC Controller at any time. Looks cool! Here's hoping someone creates a qt version some day. Doesn't SC stand for Steam Controller? kit89 Doesn't SC stand for Steam Controller? It is broken for me. Installed it from their repo and nothing. Complains about errors in some files. Tried download the source and run it as told by their page, same thing. Dependencies are installed, obviously. MGOid It is broken for me. Installed it from their repo and nothing. Complains about errors in some files. Tried download the source and run it as told by their page, same thing. Dependencies are installed, obviously. What does "errors in some files" mean? Works perfectly okay here: Ubuntu 16.04, 64Bit, openSUSE repo. Thanks for the video, Liam! Alas, I don't know what I just saw, though I watched it four times. Lol. Please tell me it's because I have no experience with either SC controller or Dota 2. But having used mouse gestures in various browsers, I think I might have an idea what is being discussed. What really caught my attention was your saying, "What's great is that it can happily work alongside Steam, as you can turn off SC Controller at any time." What happens when the two drivers are on at the same time? For example, if I'm using SCC on the desktop, yeah? And I use it to start Steam, could I keep using it while Steam runs, or must I hurriedly turn SCC off immediately after starting Steam? What happens if Steam starts and I still have SCC running? Why don't I just install it and find out for myself? That is a good question to which I have no good answer. I'll say it's because I hadn't thought to do that until just now. Time to install SCC! 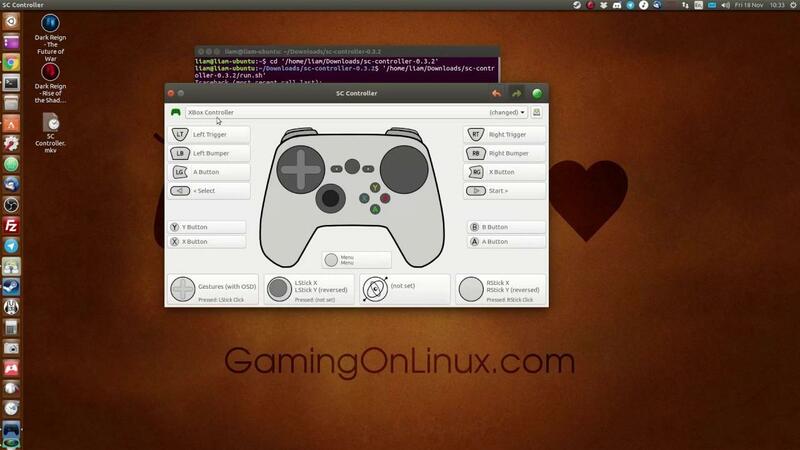 If you have SC Controller on and you load up Steam, Steam detects it as a normal gamepad. You can then use SC Controller to make any adjustments as and when needed. If you have Steam open first, SC Controller cannot be used as Steam takes over control of it. @Picoboom If you want to use the steam driver and are just after gestures, there are a number of apps that should work for that, such as easystroke.